This is the first of a series of interviews that JPFO hopes to conduct on a regular basis. We call this series “Armed and Jewish”. The idea is not to interview Israeli soldiers, Jewish American combat veterans, or Jewish police officers. Our goal is to present a sampling of “everyday” Jewish Americans, both men and women, who righteously and intelligently own firearms. Firearms ownership, for various reasons, can be a very private matter. No one, absolutely no one, has a right to know if you own a gun or not. Not your neighbors, not the police, not the city, County, State or Federal governments. “Gun control” is an immense, and potentially horrific, lie. Gun registration, firearms licensing, and any kind of compilation of gun owners is an irresistable stepping stone to a police state tyranny. Beyond that comes mass murder of unarmed citizens by their own government gone bad. This is why JPFO has, for more than 20 years, advocated the complete abolition of “gun control”. The subjects of our “Armed and Jewish” interviews will be, for lack of a better phrase, “out of the closet” Jewish American gun owners. For whatever reason, these men and women have now chosen to make no secret of the fact that they own a gun … and know how to use it. 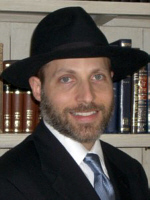 Rabbinic Director of Jews for the Preservation of Firearms Ownership. The interview was conducted by Kirby Ferris of JPFO. KF: Rabbi Bendory, tell us something about your upbringing. Where were you born and raised? RB: I grew up in a suburban town “down the shore” in New Jersey. KF: New Jersey has an almost mythical reputation as being a “tough guy” place. Did you grow up in a tough neighborhood? Did you deal with bullies and school yard pecking orders? RB: We might have thought we were tough, but we didn’t know what “tough” really is. We had our bullies and pecking order like any other school, but actual fights were few and far between. KF: Were you exposed to firearms in your youth? RB: Only in the movies! In my house, we weren’t allowed toy guns; my mother told us that guns are violent. KF: This next question is personal, but I know that people must be curious: Why did you become a Rabbi? RB: That’s a longer story than I can tell here! In brief, my rabbi suggested that I would enjoy the challenging course of study involved. I was skeptical, but I agreed to give it a try for a month. After a week, I was hooked! The Orthodox rabbinic ordination exams are the most difficult exams I’ve ever taken in my life ... and like most things in life, that which is most challenging is also most rewarding. “Rabbi” means “my teacher,” and what my rabbi saw in me that made him suggest I travel this path is that I’m a teacher at heart. KF: As you studied for Rabbinical ordination how were you exposed to the issue of self defense? KF: In my discussions with people who had never previously owned firearms, and now do, I’ve found a common thread. The decision making process of acquiring one’s own gun seems to be a two step evolution. First, one begins to seriously consider getting a gun. This introspection is usually set off by some particular event. Then, not always, but quite often, something emphatic happens and the decision to become armed is solidified and a person starts shopping for the right gun. What brought you to make the decision to go from unarmed to armed? RB: You’re right, it is a two-step process. For me 9/11 was the turning point. I was an eye-witness to the mayhem at Ground Zero. When the second plane hit, I knew that the first plane was no accident but rather that terrorism had come to America. At that point, I knew that Jews needed to be armed and prepared. KF: Was this a common response among Jews you knew? RB: No, and it still isn’t. American Jews talk about “Never Again”, but I question how many of them are prepared to mean it. Fighting anti-Semitism (or supporting organizations that fight anti-Semitism) is one thing; actually learning self-defense, with or without firearms, is quite another. Look, you know the defense mechanisms people use. Read "Raging Against Self Defense". Most of America, and American Jews are no different, are in denial about homeland terrorism. KF: Did you buy your first gun after 9/11? RB: 9/11 was the first game-changer for me, but there were others that have confirmed my decision. The shootings at the Holocaust Museum in Washington; the terrorist attacks in Mumbai. KF: Mumbai is far away -- why did that have such an impact? RB: Four terrorist teams fanned out across Mumbai with a goal of killing non-Muslims and wreaking havoc. One of those teams went to the Neiman House -- a small Orthodox synagogue. This was not a major landmark but rather an unmarked building on a nondescript street in an enormous urban sprawl. You had to go looking for it to know it was there -- and indeed, they had done just that. When this attack was planned and executed, they decided that one-fourth of their efforts would be spent on attacking a handful of Jews, that this was as important to the “cause” of Islamic terror as blowing up a hotel and terrorizing hundreds of Westerners. When such an attack is attempted in Israel, it is thwarted by an armed citizen. But in Mumbai, as is often the case in America, neither the rabbi nor anyone else in the synagogue was armed. They had no chance. KF: Alright, so you went shopping. Where did you buy your first firearm? RB: My first purchase was from Matt Carmel of Constitution Arms -- with whom I had taken my first gun safety and shooting lessons. He also introduced me to JPFO. KF: How did Matt react to you, a rabbi in traditional attire, wanting to buy a firearm? RB: He loved it! When I learned that he provides instruction and sells out of his home, I insisted that he fax me his license and credentials before I went to meet him. I was the first customer he ever had who made such a request. When I apologized to him for potentially being overly intrusive and suspicious, he said, “You’re exactly the kind of gun owner that I want to teach” -- a law-abiding citizen concerned about safety and security. KF: What was your first gun? RB: A small .380, highly concealable -- though of course at that caliber its stopping power is limited. KF: What is your favorite gun? RB: That depends on what it’s for -- like any other tool, you need the right tool for the job. KF: Did you personally know other rabbis who have chosen to arm themselves? RB: Not many. In the US, the handful of shooting rabbis I know of are military, with two exceptions. In Israel, things are different -- but even then they’ve learned to shoot in the military. But this is slowly changing as more American Jews are waking up to the changing world around them. KF: So you now owned a gun. What about learning to handle and shoot it safely? What did you do next? RB: I was careful -- I didn’t actually buy a gun until I had learned to use it safely. So by the time I owned, I knew the basics. I still remember the excitement of picking up my first gun and heading to the “Bullet Hole” indoor range to fire it. KF: How did that go? RB: The shooting went fine, but more interesting were the people. Pretty much wherever I go to shoot I’m a spectacle. You don’t see too many Orthodox Jews on the range even in areas with a dense Jewish population like NJ. I was pleasantly surprised to find out how friendly gun owners are, and I was especially pleased about the warm reception I got -- and continue to get -- from non-Jews who are intrigued to meet an Orthodox rabbi. That’s how I became “The Gun Rabbi” -- it’s a nickname that was given by a burly Catholic who loves the way I’m shattering all stereotypes of both gun owners and Jews. KF: Who had you disclosed your “Gun Owner” status to at this point? RB: Not many -- my wife knew, and my father-in-law. It took a while before I let on to anyone else. KF: What was your first reaction to a handgun in actual use? The noise, the kick, the potential lethality of the weapon? KF: What about your first gun with real stopping power -- a .357 or .40? RB: That was a bit more sobering. When it was time to shop, I found a range that rents guns. They had a wide variety, and I must have tried out a dozen different guns -- Glocks, S&W Revolvers, Sigs, you name it. I was like a kid in a candy store! I shot 9mm, .22lr from both a semi-auto and revolver, .357, .45, .40. I left there with a Sig P229 in .40 S&W -- still my favorite handgun. KF: Did you get a carry permit? RB: Kirby, this is NJ -- where you can only legally carry if you are part of the Political Class. Of course, criminals carry freely -- we’ve had armed robberies in town, and I have a close friend who was shot in his own home. (He survived.) Law-abiding citizens in NJ are disarmed sheep. Here in NJ, you’re allowed to own guns in your home and transport them -- unloaded in the trunk -- to and from the range. But no CCWs are issued without a “justifiable need”. We “little people” don’t qualify. We’ve got a “right to carry” case in the courts now that follows on the Supreme Court’s Heller and MacDonald decisions. This suit seeks to overthrow the un-Constitutional and unethical anti-gun laws in NJ, but it’s taking time. I’ve heard that NJ is the worst gun law State in America. I believe it. KF: Why did you choose to actually take this quite a few steps further and become a personal firearms instructor? RB: As I started letting people know about my “hobby”, I was surprised at how many Jews were interested. Religious or not, Jews seem to be more open to to having a rabbi teach them to shoot. Jews have a much-too-long history with being at the wrong end of the gun barrel, and most have shunned guns and shooting. We have internalized a set of quite contradictory images: the negative media stereotypes of guns and gun owners; the proud image of the Israeli soldier; the victimization of the Holocaust. We grow up with the mantra of “Never Again”, but we have no tools of defense. Are American Jews always going to have to depend on someone else? Buying a gun, learning gun safety, learning to shoot -- all require confronting these conflicting stereotypes. KF: Is your teaching different because you are a rabbi? RB: I teach something no one else can -- the Torah ethics of personal defense and gun use. It’s the rabbi in me -- I like to share knowledge and wisdom, and the know-how of defensive shooting is one aspect of wisdom. The Torah requires that a father teach his children to swim because swimming is a “defensive, life-saving” skill. While it’s a stretch to say that shooting is in the same category, there is a similarity. KF: How does an observant Jew, in his or her heart, come to the decision that he or she is willing to take a human life to defend one’s own life, or the life of an innocent? RB: How does any human being come to that decision? As Jews, we turn to the Torah for guidance. The Torah is very clear that you have not only the right, but the actual obligation to defend yourself. G-d has given you life, a most precious gift, and it is your responsibility to honor that gift. When someone threatens your life, they give up their own right to live. Jewish Law discourages killing, even in self-defense -- but when attacked with deadly force, you have an obligation to defend with sufficient force to overcome your adversary. The Torah recognizes this as not only a G-d-given right and obligation but also as a human being’s natural reaction to an attack. KF: Do you only train Jews? RB: I teach anyone who is interested -- but being a rabbi means reaching some “unserved” segments of the Jewish world. One of my favorite students was an octogenarian Holocaust survivor who, in her words, “is no longer afraid to be alone at home.” She wanted a gun for years, but with her experiences she had no one she trusted. She’s no longer afraid. KF: How and when did you make the decision to “come out of the closet” and make your advocacy of armed self defense a matter of public record? I mean, you do have a website called “The Gun Rabbi”. You sure aren’t trying to hide anything. RB: I give daily classes in Torah Law and I often choose topics based on what I want to learn and study myself. I decided to give a series on self defense. As I went along, someone asked me if I own a gun. I went public. KF: How have your lifelong friends and neighbors handled this somewhat dramatic transition in your life? RB: Many have come with me to the range, either as a one-off trip or for actual lessons. I’ve gotten very few openly negative rejoinders. KF: When did you become aware that there was an organization called “Jews for the Preservation of Firearms Ownership”? RB: Matt Carmel -- my first instructor who I mentioned earlier -- told me about JPFO. I’m hoping he’ll appear in an upcoming “Armed and Jewish” piece. KF: What initiated your decision to research and write “The Ten Commandments of Self Defense”? RB: I’m not sure if it was Chris (JPFO’s Webmaster) or Aaron (JPFO’s late Founder) who saw or heard about the series I did on self defense in Torah Law, but when Aaron found out he called me and asked if I could come up with “Ten Commandments of Self Defense.” I liked the idea and agreed to give it a try. KF: How did you come to play such a prominent part in JPFO’s forty minute documentary film “No Guns for Jews”? RB: 10C was Aaron’s idea. Somewhere along the way he sent me a copy of No Guns for Negroes to help provide material. I proposed the content of NGFJ, and he came up with the title. It was a very collaborative project. All the footage of me in NGFJ is candid -- the lecture and classes are “live on location”. For the interview, I had seen the questions in advance, but the interview itself was unscripted. So I suppose I played such a prominent part because I live the message of NGFJ. Let’s face it, having an Orthodox rabbi advocating firearms rights is “unusual”, to say the least. KF: You are now JPFO’s Rabbinic Director. You are a busy man. Why would you take on this additional significant responsibility? RB: Hashem (G-d) handed me this role. I just said “yes.” Why take on the responsibility? I’m a patriot. I love this country. America has been a blessed haven for Jews. I can’t think of a more pressing need than advocating for our rights as American citizens. While there are many ways to do that, it’s hard to identify a role more suited to who I am than Rabbinic Director of JPFO. KF: In closing, is there anything in particular you would like to say to your fellow Jews, and Americans in general? RB: Just as you don’t need to be religious to learn from the wisdom of Torah, you don’t need to be Jewish to need a rabbi -- remember, I’m your teacher, a “credentialed expert” in Torah wisdom. “The Ten Commandments of Self Defense” is based on 3000 years of Torah tradition, a tradition with a message for every person in every situation they encounter in life. KF: Thank you, Rabbi Bendory. May you never be forced to use what you have learned and now teach. RB: Shalom, Kirby. May Hashem bless you and all the righteous individuals who read our interview that you should never need to use your guns.